The thermal photographs were all shot as 320X240 pixel JPEG images using a 60 Hz thermal imaging camera which was similar in appearance to a digital SLR. 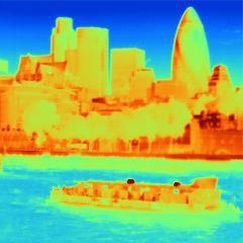 Since such cameras measure temperature, which is not part of the visible light spectrum, pseudo-colour is used to indicate variations in temperature. In the most popular of the pseudo-colour schemes, bright red-orange is used for the hottest temperature while dark blue is used for the coolest. Thermal photography consists of measuring the infrared radiation of the electromagnetic spectrum from approximately 900 to 14,000 nanometres of wavelength. Infrared radiation is one region of the spectrum, other regions being for example those of the gamma rays, x-rays, ultra violet light, visible light and radio waves. Infrared radiation is emitted by all objects and increases with increases in the temperature of the object. 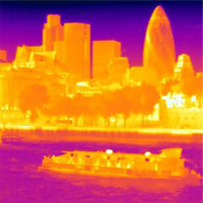 The temperatures which can be measured by means of a modern thermal camera are normally from roughly -50 °C to 2,000 °C. Infrared radiation is measured using a thermal camera in much the same way that visible light is measured using an optical digital camera. However, while digital cameras use a Charge Coupled Device (CCD) or a Complementary Metal Oxide Semiconductor (CMOS) sensor, thermal cameras use focal plane array (FPA) sensors which respond to the longer wavelengths of the infrared region of the electromagnetic spectrum. Given the complexity of the FPA sensors, the maximum resolution which can currently be achieved is much lower than that of optical sensors. Most thermal cameras currently have resolutions such as 320×240 pixels or 640×512 pixels. While the amount of emitted thermal radiation depends on the surface temperature of the object, the surface temperature is not the only factor involved. Other factors include the emissivity of the object which is being shot, the amount of radiation arriving from the surrounding environment and the atmospheric absorption between the radiating object and the thermal camera. Of the factors affecting the accuracy of thermal cameras the biggest is the emissivity, meaning the ability of the object’s material to emit thermal radiation. Every material has an emissivity value which is in the range from 0.0 (no ability to emit thermal energy) to 1.0 (complete emission of all the thermal energy). The maximum measurement accuracy of a thermal camera is only achieved when the emissivity value of the object which is being shot is known, or when the camera is calibrated on-site against a known reference source of thermal radiation. In the case of the photographs which are found in this website the camera was run using a stored average emissivity table, thus the camera was not specifically calibrated for each individual shot.